Rinpoche will continue in Taiwan, giving commentary on Lama Choepa and the jenang of Chenrezig Liberating from the Lower Realms on March 12 – 13 at Hayagriva Center; teaching and Ksitigarbha initiation – March 19 – 20 Jinsiu Farlin; and continuing the Lama Choepa commentary and giving Lama Tsongkhapa long life initiation March 26 – 27 at Heruka Center. From Taiwan, Rinpoche will go to Malaysia, first to Losang Dragpa Center for teachings on the 8 Verses of Thought Transformation, April 2 and 3. Then retreat on the 3 Principles of the Path at Jangsem Ling, April 8 – 11. Rinpoche has accepted to give the Yamantaka initiation at Losang Dragpa Centre on April 14 – 15. Next stop will be Amitabha Buddhist Centre, Singapore, April 23 – 27th for teachings on the 3 Principles of the Path ; April 29 – 30th Rinpoche will give the Great Chenrezig initiation, then May 4 – 6 Rinpoche will give Heruka initiation, and on May 7 the Cittamani Tara initiation. The next scheduled teachings are in Spain, August 19 – 21 at Nagarjuna Madrid, and then August 26-28 at Osel Ling where Rinpoche will give the Milarepa initiation and the oral transmission and teachings on the Vajra Cutter Sutra. 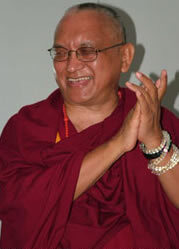 Rinpoche will also give teachings in Nagarjuna Barcelona. As you may know, unfortunately Ven. Ribur Rinpoche’s health has been poor. Two weeks’ ago Lama Zopa Rinpoche visited Ribur Rinpoche for a day, with the main purpose of offering a white Heruka long-life puja. The puja was done in private with just two or thee people present. A few days back Rinpoche suddenly said he would like to fly to Washington and personally thank Ribur Rinpoche for accepting to live longer. 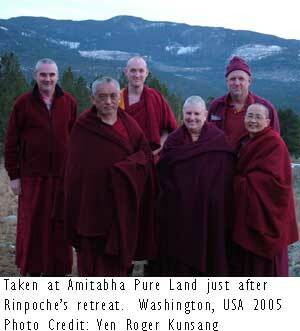 Then Rinpoche had to again do retreat for the organization which was urgent, so as Rinpoche couldn’t go in person Rinpoche sent a message through Lorne Ladner, the director of Guhyasamaja Center, who is helping Ribur Rinpoche with his medical treatment. Lama Zopa Rinpoche asked Lorne to pass on a large money offering to Ribur Rinpoche and to thank Rinpoche very much for accepting to live long. Lama Zopa Rinpoche said he really wanted to go personally to thank Ribur Rinpoche but was unable to because of the urgent need to do retreat. 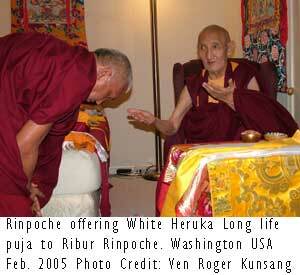 Rinpoche apologized that he couldn’t go to thank Ribur Rinpoche in person. We are seekers of enlightenment, of course not just for ourselves, but sincere seekers of the ultimate goal, happiness for others – not only temporary happiness but ultimate liberation and enlightenment. This wish comes from the bottom of the heart. I am so sorry that I couldn’t make it for the beginning of the retreat but I think you have incredible good fortune. I rejoice! First of all, you are the most fortunate ones by not being in the lower realms at this time, overwhelmed by the heaviest sufferings and continuously creating negative karma. Just simply having received a human body. It’s a miracle. It’s inexpressible that this has happened, to be free from all the suffering of the lower realms at this time. And you are so fortunate to have a precious human body that can be used to learn dharma, to understand the words and meanings and to be able to practice and have realizations. Especially that you have a human body qualified with the 8 freedoms and 10 richnesses and that you are relying on the Buddha, Dharma and Sangha, and practicing morality by engaging in the 10 virtues by avoiding the 10 non-virtues. Practicing morality stops the lower realm sufferings and gives the opportunity to receive a higher rebirth and happiness. You are so fortunate! Not only that but you have met the Dharma that reveals the Four Noble Truths. You can learn the 4 Noble Truths and actualize them, and through that you become free from samsara that’s only in the nature of suffering and is like being in the nest of a poisonous snake or in the center of a fire. This is much more amazing and unbelievable. How exciting this is, how fortunate you are! The most exciting thing is the possibility to achieve enlightenment because you’ve met the Mahayana teachings so you are able to free all sentient beings from suffering and its cause and lead them to enlightenment. How exciting this is. How fortunate we are! Even much more exciting is that we’ve met tantra so we can achieve enlightenment in one life. Or, if it doesn’t happen we can meet tantra in the next life. How exciting this is, how fortunate we are! Even more exciting is that we met the highest tantra, we can learn and practice and achieve enlightenment in just one brief lifetime. How exciting this is, how fortunate we are! Even more exciting is that we’ve met Lama Tsongkhapa’s teachings that unify sutra and tantra with the integration of the 3 deities so we can achieve enlightenment even quicker than with other Maha Anutara tantras that don’t include all this. How exciting this is, how fortunate we are! This is the most fortunate thing! Another thing is that this Chenresig practice that includes recitation of the mantra and the meditation is the most precious wish-fulfilling thing to do for all sentient beings who wish for happiness. This mantra fulfills ones own and others’ wishes, it has limitless skies of benefits. Especially here in this retreat, the long dharani has unbelievable benefits. So how fortunate you are. This practice makes it so easy to become enlightened and enlighten other sentient beings! This mantra is cherished by all the buddhas and is like their heart jewel. Just by hearing Chenresig’s name liberates us from the lower realms, purifies negative karma and is a cause to achieve enlightenment. Therefore even the name is so precious to recollect and recite in every day life. It liberates us from oceans of samsaric sufferings that have no beginning. How fortunate we are! The most special thing about Chenresig meditation is that it’s for developing compassion and brings peace and happiness to sentient beings – not only beings in this world – and it fulfills their wishes. Then those beings inspire many other people to practice more compassion and this brings peace and happiness and fulfills the wishes of other sentient beings. Then those people are inspired to practice of compassion which brings peace and happiness and fulfills the wishes of sentient beings – not only people but also animals. Even worms won’t receive harm from people. So the people stop harming animals and hunting and using animals for their own pleasure and for food. So you can see this is one way to bring peace to the world and to stop violence and destructive thoughts such as anger, the dissatisfied mind, desire and other harmful negative thoughts. The more habit you develop in this life to have a compassionate motive, in future lives you will be more compassionate. This leads to bodhicitta, which leads to enlightenment. Then you’re able to take more extensive responsibility for other sentient beings, to free them from suffering and bring them temporal and especially the ultimate happiness of enlightenment. As you develop compassion from life to life, the more you benefit others from life to life. You can see how in the long run, sentient beings are receiving limitless skies of benefits from you. We are so incredibly fortunate! The prostrations you do every day, reciting the Chenresig mantra, taking precepts, meditating on bodhicitta and doing the 7-limb practice creates so much merit. How fortunate you are! There are so many opportunities where you can collect skies of merit. Even if you don’t attend many meetings for world peace, just doing this retreat makes a connection to stop undesirable things from happening in the world. So you are benefiting people in Iraq and places where there’s torture and suffering. Meditation and recitation of the mantra actually does benefit those people. So you can dedicate these merits to all sentient beings – not only to those of this world – and they can achieve happiness and liberation. You can see how this is unbelievable. From these merits, even beings of the lower realms who have more suffering and human beings; non-believers whose attitudes are of a wicked nature and who have with anger, selfishness and the attitude seeking only the happiness of this life and those who have almost no compassion at all- all these kinds of beings receive these merits and can achieve happiness. There’s so much you can offer to the world. You can benefit all those people who have died in wars, the people over 250,000 who were killed in the recent tsunami and the millions and millions of people who have died from AIDS, cancer, etc. Worldly people who have no knowledge of what is mind lack understanding about reincarnation and karma. They only know about the survivor’s pain and suffering, but they don’t know about the suffering of those who died. The people mourning the dead keep silence for a few minutes in church, etc. but what the dead people are actually experiencing isn’t clear in their minds. Their minds are totally dark – they have no knowledge about the heavy suffering those who died will experience in the lower realms. Of course Buddhist people who have correct understanding of the mind, reincarnation and karma can understand the reality. Most of those people who died (in the tsunami) died with great fear and will be reborn in the lower realms. But since the tsunami is famous and known in the world, many holy beings have done prayers for them. The conclusion is that you are extremely fortunate to be in retreat, including the cooks who provide the food and anyone doing service and organizing for the retreat. You are all so fortunate! How fortunate you are in these weeks to be able to give time to yourself to do retreat during the 15 days of the Buddha performing miracles. In other words you’re liberating and bringing enlightenment to yourself. You should feel that this is the most exciting thing in your life, to be able to offer service for this retreat. Everyone who comes to do this retreat, even if they just come for one session, is doing the most exciting thing! For example, when you do one prostration, recite one mantra, make one light offering, (even though they are very small Christmas lights), everything you do is increased by 100 million. Every merit collected in these special days of Buddha is increased by 100 million. So how fortunate we are, it is mind blowing, unbelievable, amazing, incredible…maybe that’s enough, otherwise being so full of happy energy might burst out, explode out, then it might be difficult for every single part of the body to come back. I don’t want to see that happen because we need to take care of other sentient beings, to free them from all suffering and bring them to enlightenment. “I am sure for a long time, especially recently, there must have been a lot of thoughts going on in you about certain challenging people at the center. How I see the situation about these people is that they are quite different from others, how I see it is that they have their own particular karma, things happen to them, like they get extremely cold because their house is under trees and no sun can come or that many insects are in their house, so that they spent many months just picking up insects. Maybe it was because they didn’t keep the house clean. Anyway regardless, they have their own particular karma. It has been explained in the teachings by Buddha that everybody does not have the same karma, some people experience one thing as extreme suffering and other people experience the same thing as enjoyment. So we have to recognize these things, we can’t expect everyone to have the same karma. If you think that everyone has their own karma and how they experience things is according to their own karma (whether as a blessing or great problem), if you see it this way then you can understand things better (like with difficult people) and it can also become a cause to generate compassion. Like how the buddhas and bodhisattvas have more compassion towards those who are more evil, having heresy, more self cherishing thought, who create more heavy karma: the bodhisattvas cherish these sentient beings more, because they have more suffering. Including when you do good things but in return other people don’t see your kindness but just see harm and criticize you back, so this is including those people. Thinking in this way helps you generate compassion, patience and tolerance. ….Many centers have somebody like this in the center, they have the karma to have people like this around, I think most centers have someone like this, maybe even one or two people. So it’s just karma, having somebody there like this is extremely helpful and kind, as I mentioned in the thought transformation teachings, these people really make you practice thought transformation, especially tolerance and compassion. These difficult people exist because it’s empty, totally empty because it is dependent arising, depending on causes and conditions, on the base and the thought labeling and believing on that. So here I am just mentioning another way to look at it. Different viewpoints and different ways to use the situation for enlightenment, which helps for enlightenment. Using the situation in this way helps for your practice, it helps for your future enlightenment. However you are an exceptionally kind person and able to offer service to the students in the center, just to have that thought, to rise this thought to help them and serve them is unimaginable. Rinpoche used His opening talks at the CPMT meeting to go over the benefits which the FPMT organization offers, the achievements we have accomplished and in which Rinpoche invites us (reminds us!) 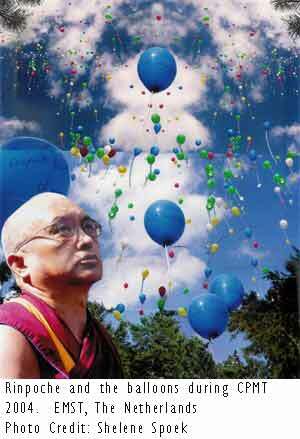 to rejoice, and then states what Rinpoche Himself sees as the goals of the organization. ‘Since Lama, whose holy name is extremely difficult to express, who is kinder than all the three time Buddhas, as Lama, I don’t remember which year, probably some of the old students would know, when Lama formed the organization in Dharamsala, I was there that time. The time that Lama gave Vajrayogini commentary there with all my coughings! All my coughings mixed with the commentary on Vajrayogini! Which year? Oh, ’86. Roger remembers! At Tushita when Lama was making preparation to stabilize the organization, so that Dharma activity can be continued in this world for a long time and also in a very extensive way. So everything was prepared during Lama’s time, the progression of the future of the organization. All the development up to now that has been happening, that we are able to benefit many different parts of this world, it was already prepared during Lama’s time to make our lives meaningful. All the direct, indirect students, everybody’s life made highly meaningful, all the meditation practice as well as the Dharma practice serving others and serving our kind compassionate Guru Shakyamuni Buddha’s teaching, to preserve and spread the teachings, because without Dharma there’s no happiness. Even the happiness of this life you can’t achieve that without Dharma, without having created the cause, the virtue. Before the result you experience the cause, so any happiness has to come from virtue. So therefore without Dharma there’s no happiness, not even temporary happiness, leaving aside ultimate happiness, total liberation from the whole entire oceans of samsaric sufferings and full enlightenment, cessation of all the mistakes of mind, and completion of all the realizations. So therefore, you see, I think, during Lama’s time, before Lama passed away, everything, Lama started. Whatever progression happens up to now in this world comes from that source, from Lama’s kindness. So I’m very happy that all of you put effort to come, even those from very far, with a lot of expenses, with much hardship, in spite of that, bearing that, able to make the time, able to be here to share experiences, to help each other, to share your experiences, your enlightened experiences and to help each other and to solve difficulties with each other. How to make the organization most productive, beneficial to the sentient beings, not only sentient beings in this earth, this globe, but sentient beings in all the universes. How to make the organization be most useful, beneficial, which includes your own personal life, how to make it most beneficial to others, to other sentient beings and the teachings of Buddha, which is our main goal of our life, purpose of taking human birth at this time, the essential purpose of why we have taken human body this time. So that’s the project of our having taken human body, our objective of our life. So, like that, same: Making the organization most beneficial or making your own individual life most beneficial, most productive, most satisfied life. However you can be wish-fulfilling to others and offer service to the Buddhas, bodhisattvas as well. Of course, then also to root guru His Holiness the Dalai Lama, as well as, as I mentioned before, to Lama Yeshe. With the organization there’s a base, there’s a foundation that Lama’s different lives can benefit, [from which] each reincarnation can benefit sentient beings extensively. So I’m just Mickey Mouse, at the moment just leading, not really that much I can do benefit the organization, but little that is possible, so like that, you see, to help.